A comprehensive prison and sentencing reform package passed the U.S. Senate last night, which original cosponsor Iowa Senator Chuck Grassley says is the most significant bill of its kind in a generation. Grassley says the “historic” measure, called the First Step Act, brings critical reforms to fight crime and promote safe communities. “Our goal is to bring some fairness and common sense to a system that needs to work better for the American people,” Grassley says. “Our bill will reduce recidivism, reduce crime and reduce the taxpayers’ burden.” The legislation would cut some sentences for certain low-level, non-violent offenders, according to Grassley, while preserving the needs of law enforcement to tackle criminal enterprises. “The legislation will maintain the tools that have worked for reducing crime, like mandatory minimum sentences, but we make sure that they fit the crime,” Grassley says. 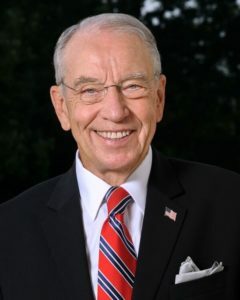 “Most prisoners are going to be released back into society so we built programs to ensure prisoners have the opportunity to become productive members of our society.” Senate passage of the measure is “an important victory in our years-long effort,” Grassley says, which has brought broad bipartisan recognition of the need for reform. “While these may sound like common sense changes, the criminal justice laws haven’t been significantly updated in decades,” Grassley says. “This is a once-in-a-generation opportunity. It’s been a delicate balance building this cooperation.” Iowa’s other U.S. Senator, Republican Joni Ernst, also voted “yes” on the bill and was an early sponsor, in Grassley’s words. The measure also has strong bipartisan support in the U.S. House, Grassley says, where he expects swift passage.